Contacting outdoor kitchen builders and outdoor kitchen contractors may help you in getting an exquisite outdoor kitchen. This is question that most of the individuals would answer in “Almost 90% of the time”. Having an outdoor kitchen may sound luxurious but for many, it is their way to spend weekends and enjoy cooking and weather. So if you plan to enjoy weather while cooking then you must consider to set up an outdoor kitchen. Planning the budget before you exhaust your resources is the best way to get you an outdoor kitchen that won’t go beyond your limits. Carefully plan how much you want to spend on the preparations and implementation of the idea. This way you will be keeping track of your spending. Outdoor kitchens require you to be creative. You need to consider the space you have and the size of the kitchen. The size more likely would depend on the kitchen appliances. Outdoor kitchen contractors may show you different ideas for your kitchen. Select the one that falls under your budget and fill up your space. You are setting up a kitchen and not a garden so you need to take into consideration what sort of floor you are settling for. Shortlist your preferences based on different conditions like is it durable, stable, non-slippery and water resistant? You may go for a wooden floor or tiles. Your outdoor kitchen builders may help you in deciding the better options for this. Kitchen appliances are the most important objects to consider for. Seek out the companies that will help you in getting reliable appliances. But when you are doing so, remember that kitchen appliances will determine the size of the outdoor kitchen. So if you don’t have a lot of space then select the appliances that would fit in perfectly. Weather conditions may get worse when it rains or the sun is too hot. So always consider shielding your kitchen. 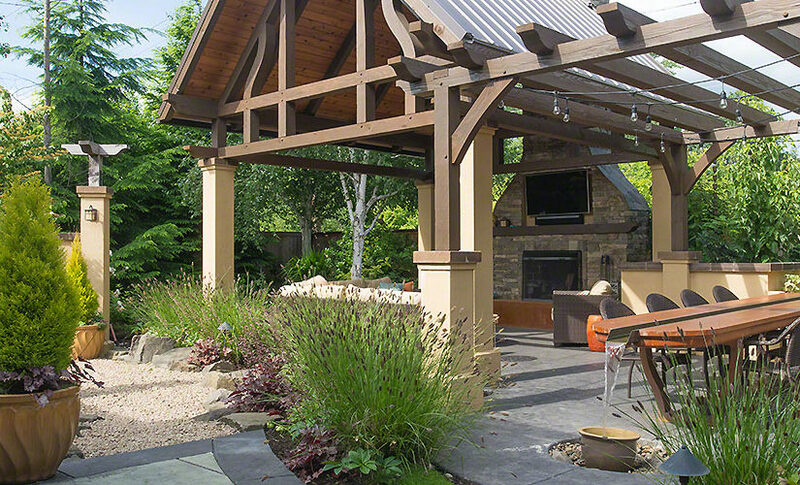 Get your outdoor kitchen builder to so. Whether you want a tin shelter or a cemented roof, it should cover the main area (cooking range and appliances) from the weather. Having a kitchen means you need to have space for placing utensils, spices, bottles and dishes. You can have cabinets alongside cooking range, under the shelf and wash bowl. You can also go for cabinets on the back wall as well. If you are setting up an outdoor kitchen, you need to make arrangements for seating and sighting as well. If there is a lot of space you may go for having a large dining table surrounded by dining chairs. But if the space is not too much then you can settle down for simple lounging chairs with a round table in the center. Pay attention to how the lighting should be. Go for setting up the globe over the ceiling. Make use of string lights across the seating area to make your outdoor kitchen look dreamy. The main equipment of the kitchen is the cooking range. Whether you want to go for gas, electric or wood-fired grill, it is up to you. But as the cooking range is the focus of the kitchen then exhaust all the options you have before you settle for one. If you like having BBQ then BBQ grill is should be your preference. Outdoor kitchen setting demands that you should equip your kitchen with items that will add to its beauty. Place flowering plants that are low-maintenance around the kitchen. Hang pots around the entrance. Paint the pots with bright colors to brighten up your place. Obviously, the above steps are just recommendations I have followed based on what my outdoor kitchen contractors long island suggested. You should discuss your options with your outdoor kitchen builders to achieve dreamy, mesmerizing and exquisite outdoor kitchen. Previous Previous post: Is It Time for Commercial Heating Replacement?